WHAT CAN WAR ROOM DO FOR YOU? Tap into War Room’s HUGE library of hundreds of traffic strategies, and benefit from over 150 different businesses all sharing what’s working right now. No one has more data than War Room and its members on the best ways to convert your traffic into paying customers and clients. Get access to the equivalent of a full-time split-testing team to find out the very best strategies and tactics that will multiply the number of people who see your offer AND buy. In business, the biggest deals never happen as you sit behind your computer or in your office. The real needle-movers happen through relationships. 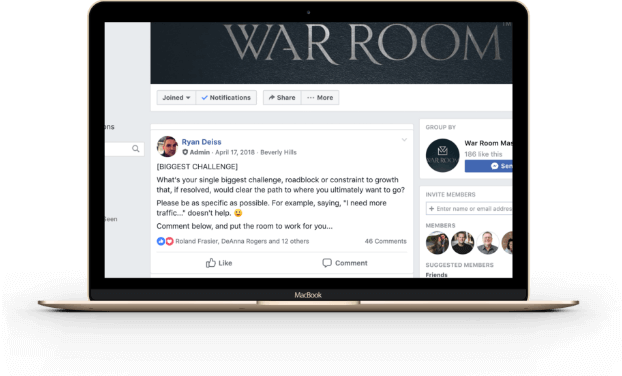 War Room offers you an instant network of hundreds of direct connects with entrepreneurs who own businesses earning 7, 8, 9 and even 10 figures per year, who actually WANT to connect with you. Imagine the networking opportunities and the deals you could create with that kind of access. It’s easy to become a slave to your business, but War Room members have access to dozens of tools and strategies that can help ease your workload and give you the freedom to build your business and escape the grind of doing daily tasks. At each meeting, and in the Facebook Group in between meetings, members share the systems that they are using to accomplish more while working less. 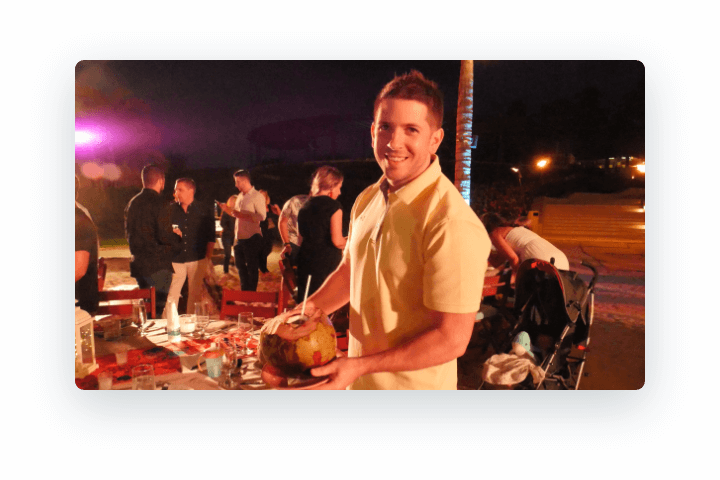 Access over six years worth of our best templates and tools for hiring the best team, building a company culture, creating SOPs (standard operating procedures) and systems that allow your business to operate whether you’re there or sipping pina coladas on the beach. Systematize and even automate your customer onboarding process, traffic sources, mergers and acquisitions program, most effective client acquisition, activation, monetization, retention and referral programs. Access our experienced team and its strategies for buying and selling companies so you can grow faster through acquisitions. 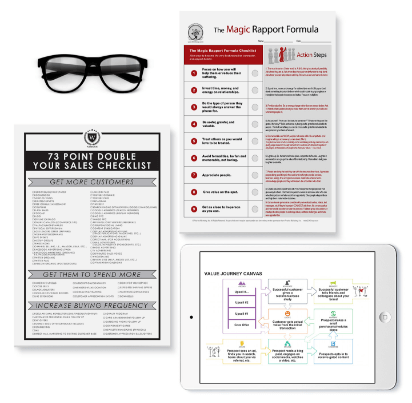 Tap into our best tools for increasing valuation and selling your company for the maximum price possible to the best buyer in the smartest way possible. Increase recurring revenue and customer retention to maximize your business’s valuation. Access our strategies that we’ve used to more than 6X our own business’ valuation multiples by repositioning into the categories that the investment banking community is willing to pay the most for on exit. Learn how to convert “static” one-time income into a monthly recurring revenue (MRR) stream to your business, and also discover how to profit from unconverted and even unqualified prospects. Our extensive content library, supplemented with the latest what’s-working-now shares from members ensures that you create and maintain the highest MRR possible for your business. Leverage our community of entrepreneurs who are eager to find partners to work with, sell to, buy from, refer among and otherwise create relationships with to do more business together. Deploy War Room members’ tested and proven tactics, strategies, checklists, worksheets, and sales tool library to convert more prospects into instantly-paying, high-Average Cart Value, High Lifetime Value clients. Build a “walled garden” around your best customers by leveraging the collective experience shared freely by your fellow War Room members on exactly what they are doing to reduce churn and increase customer retention. Tap into a community of 150+ members in 17 countries who are all working together to grow and scale their businesses… and get help and support from a peer group who truly cares. Sometimes the best thing you can do for your business is to get away from it for a bit. War Room meetings allow you to lose yourself in an 5 star resort environment for a few days each quarter, where you can enjoy yourself in an immersive community of like-minded peers who you can relate to, connect with, give to and learn from. It’s important to work hard, but it’s also important to recharge and take time to work ON your business, away from the daily grind. of your War Room membership. "They are just ninja in understanding technology, strategy, communication, copy and business." "The money you invest in yourself pays dividends." "I’ve been to a lot of masterminds. I mean, A LOT. And a lot of them are BULLS***! But War Room has a quality of member that I’ve virtually never seen anywhere else in the world."